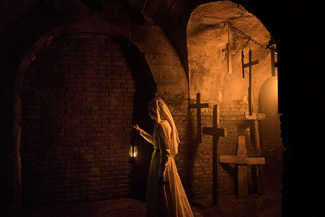 The Nun wakes up the box office this weekend, ending the run at the top by Crazy Rich Asians in a big way. The second spinoff from The Conjuring series (Annabelle is the other) was very easily the #1 film on the weekend, taking in a solid $53.5 million for the weekend. Despite terrible reviews, The Nun's pedigree was enough for audiences that it was essentially bulletproof. You could also make the argument that the last two weekends of terrible new releases meant people really wanted to go to the movies. The post-Labor Day weekend is also when IT launched last year with a ridiculous $123.4 million. So maybe this weekend is starting to become a thing. The Conjuring franchise has only been a thing since 2013 and all five films to this point have been extremely successful, with three of the four previous films crossing $100 million (and the one that didn't, Annabelle, earned $84.2 million on a $6.5 million budget so we'll give it a pass). The first four films in the series also totaled up over a billion worldwide. There is already a third Annabelle film slated for release in 2019, along with a third Conjuring film in development, and I'm sure a sequel to The Nun will be announced any day now. After three wild weekends at the top, Crazy Rich Asians slides to second place, down 38% (a number nobody would have blinked at had that been its second weekend decline) to $13.2 million, giving it $136.2 million after four weekends. The sudden jump in the weekend drop probably ends the $200 million dream, and indicates that Crazy Rich Asians was partially benefiting from a marketplace devoid of quality in the last two weekends, but this is still one of the best and important box office stories of the year, no matter how you slice it. We now await all the attempted knockoffs in the next year before we finally get to the second book in the series, which Warner Bros. should get on, pronto. The other new release this weekend lands in third as Peppermint, starring Jennifer Garner, earns a middling $13.2 million on the weekend. Aiming to be a female Taken (it helped that it had the director of that one), this one missed badly, earning just 13% Fresh at Rotten Tomatoes. While not an expensive film (a reported $25 million budget), I don't really like its prospects to have any box office longevity, which continues a miserable late summer for STX Entertainment, as neither this, Mile 22 or The Happytime Murders were able to breakout. Warner Bros., meanwhile, is having a fantastic last month as The Nun, Crazy Rich Asians and our fourth place movie this weekend, The Meg, have all been hits. In its fifth weekend, The Meg added $6 million and has earned $131.5 million to date. It's foreign earnings that are carrying the day here though, as it's approaching $500 million worldwide, which makes the reported $150 million price tag hurt a lot less, and likely guarantees a sequel.